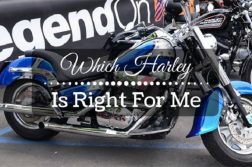 What purpose does a motorcycle exhaust wrap achieve? What will you gain by wrapping tape on your bike’s exhaust header and pipe? Are there any potential downsides to taking on such a project? 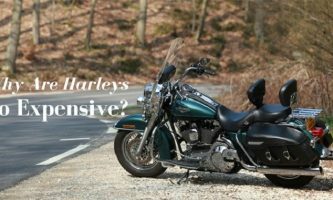 For starters, motorcycle exhaust wraps come with several benefits. Apart from giving your bike the custom old school look, the wrap will deliver improved performance. 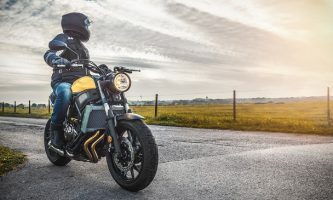 There are so many exhaust heat wraps on sports bikes, rat bikes, customs, and cruisers (among others) because wraps give bikes a retro look that is highly performance-specific. As such, the perfect wrap will accent your rat chopper, bobber, or any other bike you have. Further, it will give you that aggressively industrial look bikers like. That said, exhaust wraps are heat resistant. 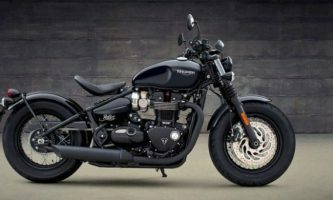 Typically made out of titanium, the material was made for wrapping around exhausts (or the manifold or exhaust header depending on the type of bike). 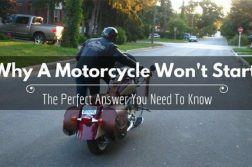 By so doing, you will increase the overall density of the gasses coming out of your exhaust – even though your bike will lose heat in the process. Further, the motorcycle exhaust wrap will provide insulation and protect you from getting burned. Last but not least, it will ensure that the exhaust heat doesn’t radiate back into your engine, which might reduce the bike’s efficiency. 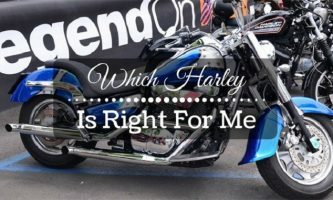 Most bikers decide to wrap the exhaust on their motorcycle for two main reasons. First, they like the new look. Then, the wrap offers heat insulation. Since this is a simple project, you might be able to do it yourself. However, it would greatly help if you had an extra set of hands to help you. Since motorcycle exhausts are hot, it is likely that might end up burning your clothing or legs if you aren’t careful. By wrapping the pipe, you will give it a protective film that will boost your safety. In the same way, the wrap will make your old muffler pipes look as good as new. Using the correct sized wrench, remove the exhaust from your bike’s engine. You’ll probably find a couple of nuts in the manifold. Use a large nut driver to get these out too from the muffler seal. Use some warm soapy water and a soft towel to thoroughly clean the entire surface of your bike’s muffler pipe. After you are done cleaning it, let it dry (for around half an hour) before you proceed to the next step. With a vise or a pair of clamps, take your muffler pipe and clamp it right into place. As you do this, correctly position the pipe in such a way that you can quickly reach around its diameter without necessarily having to move it too much. We would recommend that you clamp it on another piece of pipe, to a table, or to a straight pipe. When you do this, you will have an easier time working on the muffler. Next up, you will have to work on the paint job. To do this, get the can of heat-resistant paint primer you bought for the project. Then, spray the muffler pipe’s entire surface area. 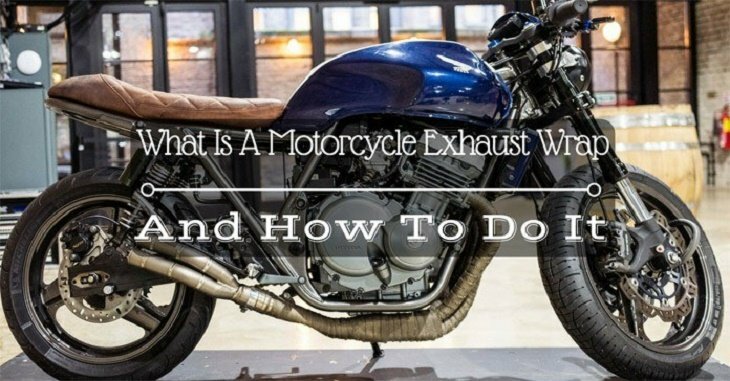 Pay particular attention to the area where you will be installing your motorcycle exhaust wrap. Before you start the priming, ensure you go through all the directions printed on your primer can. After you’ve worked on the muffler, allow it to dry up as you proceed to the next step. Before installing the wrap, we highly recommend that you first soak it in water for anywhere between 15 and 20 minutes. By so doing, you will make it all the more pliable. Further, it is far much easier to work with a soaked wrap that with a regular one. Soaking will allow your bike exhaust wrap to attach to the metal surface on your muffler pipe better. Slowly start applying the wrap all around the exterior of your bike’s exhaust pipe. As you wrap the pipe, you should overlap any previously-wrapped section by 3 or 4 inches. While wrapping the muffler, try to ensure that the wraps are as tight as you can get them to be. By so doing, you will reduce air bubbles and movement from affecting your exhaust in the future. We highly recommend that you use hose clamps to hold your wrap in place. The best clamps for this job are the polished or the stainless steel kind because they tend to end up looking better than their counterparts. Once you are down, stop the project to allow the wrap to dry naturally and adhere to the muffler. This resting period should take 15 minutes or so. After that, you can kick start the process of reinstalling the exhaust system on your bike. Now, confirm that it is firmly in place. Then, start your bike and rev the engine up for a couple of minutes. By so doing, the heat will go all the way through your exhaust pipe to dry the wrap further. This heat will also cause the motorcycle exhaust wrap to adhere to and bond with the muffler pipe. At this point, you can take a step back and watch the results of your handiwork. You probably started planning the project a while ago, and you have finally got to the destination: success. Congratulate yourself on a job well done. For starters, the high temperatures of the exhaust might lean out some fuel mixture from your engine. At times, this might happen severely. If the lean situation gets out of hand, it might cause engine failure. 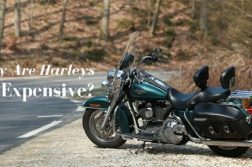 Therefore, after you have wrapped the motorcycle exhaust wrap around your bike, you should seriously consider re-jetting your bike. Alternatively, get a change in mapping – although this will depend on the fuel management system in your motorcycle. Performing the motorcycle exhaust wrap might also raise the risk of pipe and header damage arising from the excessive build-up of heat. In fact, a couple of reports of cracked and split exhausts have come about from the installation of exhaust wraps. Perhaps your bike’s pipes are scratched and blue, but they still serve you well. In such a situation, most people spend extra money and time looking for the perfect set of pipes. However, this isn’t necessarily the smartest move especially when you consider the fact that you can wrap the pipes up at a fraction of the cost. From making your bike look good to increasing its performance, bike exhaust wraps are beneficial. In particular, the wraps will keep your pipes from radiating heat, which might be another source of danger you should avoid. Additionally, the wrap will keep exhaust gasses from leaving the bike’s engine hotter than it should be. By so doing, it will effectively improve the outflow of gasses through the motorcycle’s pipe. Last but not least, using a wrap will keep the heat that would otherwise have radiated towards you from the pipe. In this, it will protect you against severe burns that might have affected your bike, body, and clothing. Enjoyed this tutorial? Learned how to install a motorcycle exhaust wrap? 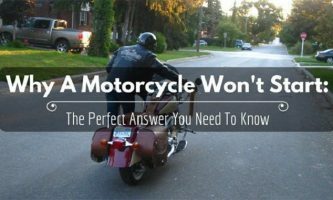 Now that you know how to do it, you should always remember that this is one of the most critical of the projects you can carry out on your bike. If you would like more information about this topic, or if you have something to share, please feel free and comment below. Sharing is caring – spread the word out if you liked this article.